Vera Wang now has a website dedicated to Bridal Fashion and much more regarding the entire world revolving around weddings. 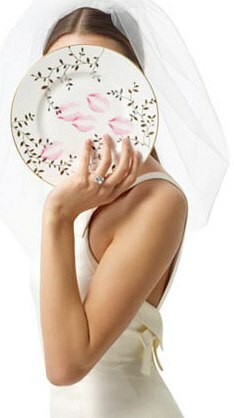 This article is a brief introduction to the Vera Wang on Weddings resource. A couple's ultimate wedding resource. Their unique site features Vera's ideas and inspiration and the ultimate selection of gifts and registry. Here is an example of some of the wonderful information that you will discover at the Vera Wang on Weddings website. "For a bride attempting to express each facet of her personality in one dress it is no easy task. Whether she is a schoolmarm or siren, flower child or princess, socialite or career girl, or a bit of each rolled into one, the bride should choose a gown that reflects whom she is above and before all else. A wedding gown must always embody the individual. Wedding dress design begins with the fabric. For more conventional wedding gowns, certain fabrics have practically become generic. Stiff or substantial, these materials have the necessary body to respond in a precise way when draped. They are also ideal for fitted bodices or bustiers. Preferred fabrics for structured gowns include stiff, opaque and shimmering Duchess satin, silk taffeta, silk Radzmere and taffeta blends. Tulle, originally used for petticoat and underpinnings, possesses a charm and beauty all its own. Silk faille, suited to a full extravagant shapes, and basket weaves, with their lighter and crisper qualities, are also appropriate. Some brides opt for a soft constructed gown that allows sheer comfort and body articulation. Choices might include a versatile silk crepe, a sensual silk charmeuse, a sheer georgette or an even sheerer chiffon. A more fashion-conscious bride might look to matte and wool jerseys." Learn more about Vera Wang. In 1990, inspired by a new vision where fashion and bridal meet, Vera Wang opened a bridal salon at the esteemed Carlyle Hotel on New York City's Madison Avenue. Retailers, editors and peers quickly noted the impact of her innovative bridal collections and encouraged Vera Wang to extend her design sensibility to ready-to-wear and bridesmaids collections. Eighteen years later, Vera Wang is no longer an emerging brand. Vera Wang's new product introductions reflect her vision to create a lifestyle that goes beyond core bridal, maids and ready-to-wear and into publishing, fragrance, beauty, accessories and home. Vera Wang collections are positioned at the highest end of the luxury market. Driven by artistic, modern and luxurious design and style, couture-like quality and a high level of customer service, Vera Wang's collections hold impeccable customer appeal. Vera Wang collaborates with leading global partners, directly employs more than 200 people and manufacturers the majority of its bridal collection in company-owned workrooms in the United States. Learn about the Vera Wang Rock Princess Fragrance. Have you ever dreamed of becoming a fashion designer?